After East African war service and twelve years in the Tanganyika Veterinary Service during which he visited Kilimanjaro, Mt. Kenya and Rwenzori, Guy Yeoman returned to work in England, but in the 1970s an interest in conservation rekindled and he has devoted much of his time (and not a little energy) to furthering the cause of conserving the mountain forest areas of Western Uganda, in particular Rwenzori. This book skilfully interweaves three major themes and one good story to give a text which provides enjoyment and interest in equal measure. Add to this the illustrations and the extremely high quality of production, and you have a magnificent book which makes the price tag seem very good value. After several visits in the 1980s to the Rwenzori range and the Virunga volcanoes on the western border of Uganda, Yeoman decided to promote the case for declaring the Uganda side of Rwenzori a national park and a World Heritage Site (a status which already exists on the Zaire side) through the production of a book which would draw attention to the pressures and dangers which were building up, as well as to the beauty and attractions of the range. The story is of the 4-week expedition which he made in 1987 for the purpose of creating the material for the book. One could not wish for a better collection of colour photos, including many double page spreads which bring out the majesty and the mystery of the snow peaks and the vegetation with tremendous effect. But the expedition was really centred on the author's brilliant idea of communicating the beauty of the unique Rwenzori flowers and plants through paintings. These were done by Christabel King, a freelance botanical artist who paints for Kew Gardens. Twelve of her beautiful paintings are reproduced in the book. The leisurely progress of the artist, three female companions and the leader up to 14,000 ft and back tells the story of camping and cooking, mud wallowing and tussock jumping, mist and rain and sometimes sun, and the companionship of the Konjo mountain porters that are the stuff of Rwenzori expeditions. Into this framework are worked a number of themes. The vegetation, flora and wildlife are described as the expedition reaches each altitude zone - Rwenzori's giant groundsel, lobelias and moss-draped heathers are larger and more luxuriant than those of the other E. African mountains. The history of the exploration of the range is traced. The characters of the Konjo porters who accompany the party are set against the background of this mountain tribe's history and lifestyle. 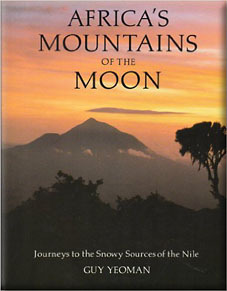 The conservation theme had earlier taken the author to the Virunga volcanoes, another source of the Nile and another candidate for the title Mountains of the Moon (is this why the publishers chose an admittedly fine sunset photo of Muhavura for the dust cover?). The result is two excellent chapters on this area in which the habitat and habits of the mountain gorilla are described, and the conclusion drawn that Zaire has been more successful than Rwanda and Uganda in protecting forest slopes from encroachment. A Rwenzori national park, the author concludes, must protect the forested lower slopes from further encroachment, but must also accommodate the interests of the indigenous Konjo and involve them as partners in management of the area as a sustainable and renewable resource. It is encouraging that the Uganda Government has recently made a formal declaration of a national park and steps are in train to define its boundaries. This is a book rich in interest, information and ideas: it is also a very good read and the author has a very attractive style, both in the descriptive writing and in the way he works in stories of his own experiences.